The national attitude toward authority figures has been rotting for 50 years. The rot has become so extensive, that we can now hardly go a day without encountering its stench. What started as protests against ‘The Man,’ has coalesced into a nation-wide attitude that screams when people engaging in illegal activities are killed when resisting arrest and remains silent when police officers are killed for doing nothing more than sitting in their car. Naturally, I can’t help but try to understand what has brought us to such a dark place. What is it in our national psyche that sees injustice of criminals dying but sees justice in the retaliation against the front-line soldiers against injustice? I must admit that I believe the media has an agenda when they go about reporting certain stories. I believe that the narrative will always go along the lines that it is a racist white person has deprived the black person of their fundamental rights and that the white person must face justice by losing their own life. We saw it with Treyvon Martin, and we’re seeing it now with Garner and Brown. But what if we rewind the clock a little bit further back to when the police started being shown as being in the wrong? The date is March 4, 1991. Rodney Glenn King III was driving down a Los Angeles freeway with two friends. The three men spent the evening watching a basketball game and consuming alcohol. Rather than find someone not intoxicated to drive them home, they drove themselves. A police officer noticed that King’s car was traveling in excess of the speed limit, but the fact that a DUI would violate King’s parole, King refused to stop. He then initiated a high-speed chase not just on the freeway, but took the chase off the freeway and into residential areas while endangering the lives of many by engaging speeds between 55 and 80 MPH. When the chase finally ended, events ensued that ultimately led to the savage beating of the three men by the LAPD. The footage of the police beatings became a paragon piece of evidence of police brutality. The incident with King combined with the current incidents involving Michael Brown in Ferguson, Missouri and Eric Garner in New York City follows the same pattern. Each of the three men was in clear violation of the law. King drove under the influence, Brown robbed a convenience store, and Garner sold individual cigarettes. Police officers responded to these violations as any officers would with questioning and determining probable cause to make an arrest. The officers attempted to make the arrest. King, Brown, and Garner all resisted arrest to the point that police had to result to brute force in order to subdue the offenders. Two men ended up dead and one severely beaten from the encounters. The media portrays the offences of the police officers while glancing over the criminal acts of the offenders. The public demands ‘justice’ for the beaten and the deceased. On examination of the evidence, the offending officers remain unconvinced of any wrongdoing. The public is enraged because the stories have been spun that heavy-handed police officers have been allowed to walk free. Rioting ensues that damages property, causes human injuries, and results in further death and general mayhem. While many lay the blame on the excessive brutality of arresting police officers, I can’t help but wonder if the perception of heavy-handed police tactics is only a symptom of a deeper problem. Like many countries before it, the United States was once engaged in the practice of slavery. Human men were bought and sold by other human men. Countless Africans were torn from their homeland and made to be a significant part of the core labor force that drove the early U.S. economy. Eventually the time came that America came to its senses and saw fit to end the practice, though not without the cost of hundreds of thousands more human lives. America should have been washed free of its sin with the lives that were lost to combat and disease during that savage war. It has been 150 years since the end of the Civil War, and yet our society is still marred by racial division and contention. From generation to generation, old hatreds continue to be passed down the line rather than our society being able to forget the offenses of our fathers. At least, that’s the way the media likes to tell the story. The election of our first president with African heritage was supposed to represent a healing of racial tensions and divides. This was supposed to be the time that we came together as Americans without distinction. 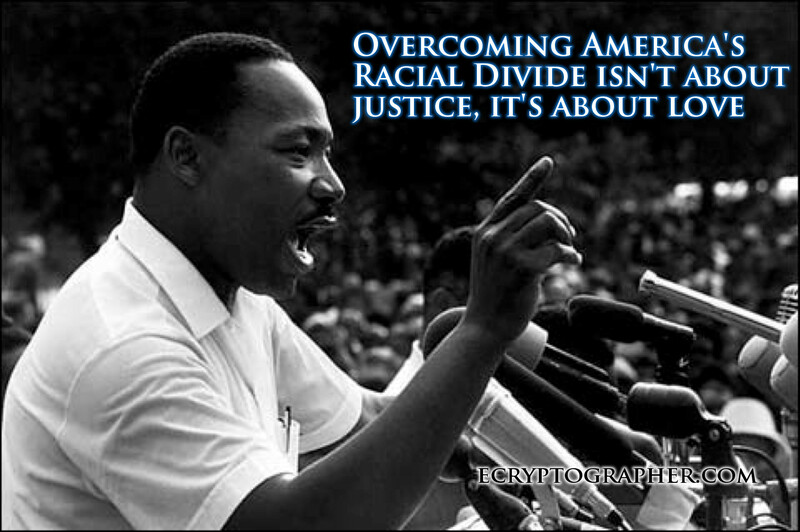 Sadly it remains apparent today, as it did with the Reverent Martin Luther King, Jr., that America’s race relations is bigger than any one man can hope to overcome. What does this have to do with all that’s been going on? There comes a time when we need to say that enough is enough. As a society, we acknowledge that slavery is one of the most abhorrent things that humans can inflict on each other. It is part of our past but it no longer needs to play a part in our present or our future. I’m concerned about a better world. I’m concerned about justice; I’m concerned about brotherhood; I’m concerned about truth. And when one is concerned about that, he can never advocate violence. For through violence you may murder a murderer, but you can’t murder murder. Through violence, you may murder a liar, but you can’t establish truth. Through violence you may murder a hater, but you can’t murder hate through violence. Darkness cannot put out darkness; only light can do that. Hate is an emotion that is all too prevalent today. Hate has motivated the feelings that have led some to advocate the killing of police officers. Hate does nothing but divide. Hate is the barrier that puts us at odds with others. But the only way to overcome hate is with love and tolerance. Until we learn to love rather than to hate, this country will continue to be at war with itself. Until we learn to love rather than to hate, the scourge of the civil war will continue to plague society. Absolutely there are racists and there are bad cops. But for every racist and bad cop, there are thousands of good people and good police officers. We should never advocate violence against our fellow men. Violence has too long been a part of the racial divide. We must replace violence and hate with love. If we could do that as a society, we wouldn’t need police officers.